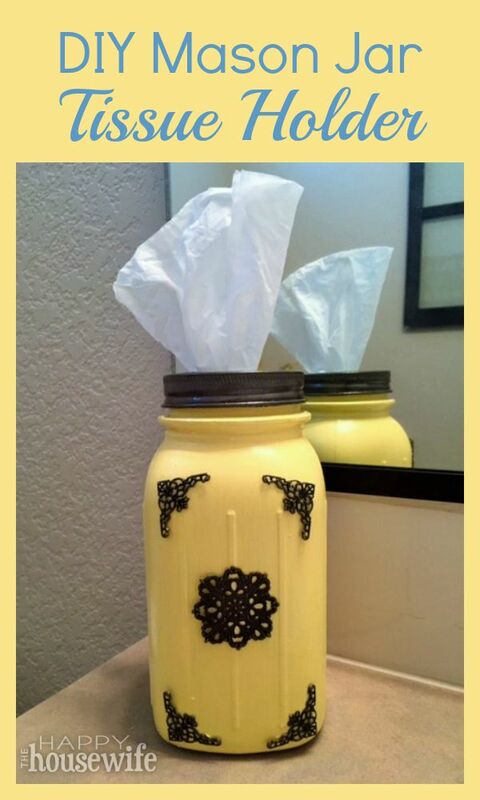 You need this super cute mason jar tissue holder in your life! Have you ever put much thought into your tissue box? I never really had until one day when I was doing my grocery shopping, and tissues were on my list. Then I was in the tissue aisle and had a hard time finding a box that would go well in my bathroom. I mean come on, your tissue box has to fit in with your decor…right?! Then I thought how cool it would be to have a nice piece of decor in my bathroom that would hold tissues! I would never have to worry about finding a tissue box that fit in with my bathroom again. And we are also talking about saving precious life minutes here. No more wasting time in the tissue aisle! 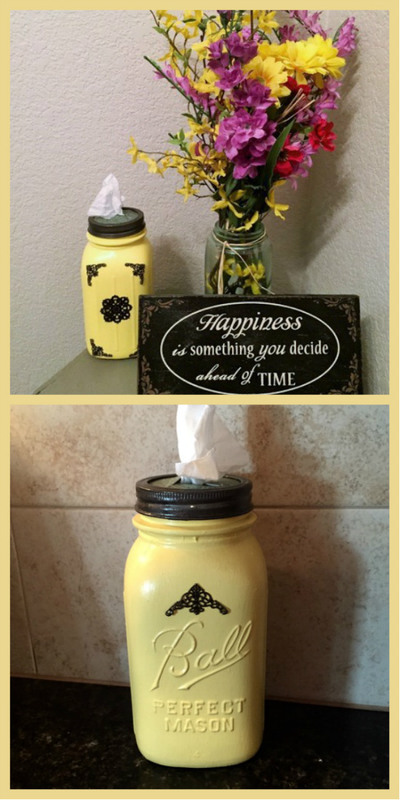 So, I made a super cute Mason jar tissue holder. It looks great and will always work in my bathroom. And if I change my decor, I can just make a new one! Tissue (I used Kleenex Perfect Fit boxes because they fit perfect in the mason jar. But you can use any tissues. 1. 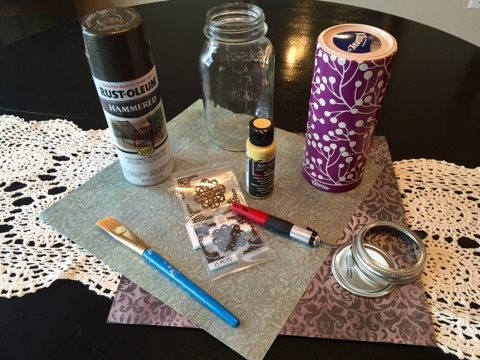 Paint the Mason jar with craft paint. I did 4 coats of paint. Make sure to let each coat dry all the way, otherwise it will create clumps. 2. Spray paint the ring part of the lid. You will have to do 2 – 3 coats on this. 4. Put it all together. 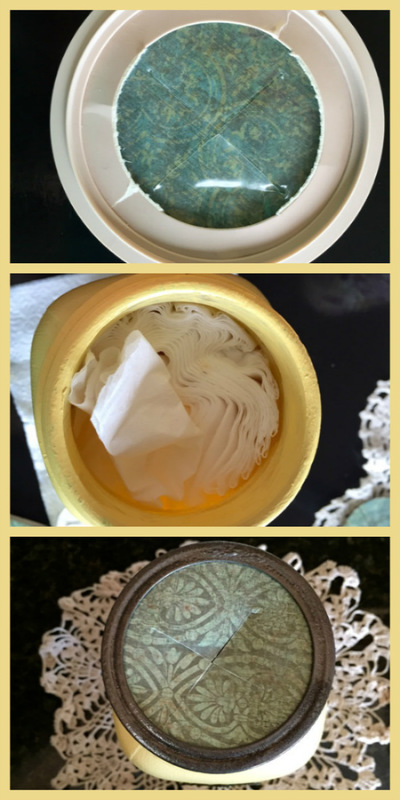 After all paint is dry, add the tissues to the jar and close with the scrapbook paper lid and the spray painted ring. 5. 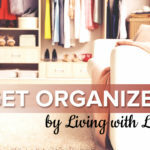 Add any stick-on craft embellishments you like. That is it! 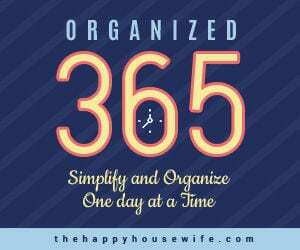 This is such an easy craft with a great outcome. I just love it!